Roasted okra is simple to prepare and delicious. Okra loses its characteristic sliminess when roasted and develops a sultry flavor. And it’s even easier to make in the air fryer. My new favorite way to eat okra is so simple and easy that it almost can’t be called a recipe. All you have to do is wash the okra, put it in an oiled baking dish, sprinkle it with seasonings, and bake it. The beauty of this is that no cutting is involved, so you never come in contact with the dreaded slime! The okra come out slightly crispy on the outside, tender on the inside, and they’re perfect finger food (like green French fries, but don’t use ketchup). Even my husband, who says that okra is not his favorite vegetable, loved these. For me they’re the perfect side dish or light lunch–super-easy, fat-free, and delicious. One thing to bear in mind when you’re buying okra is that the smaller the okra, the better. 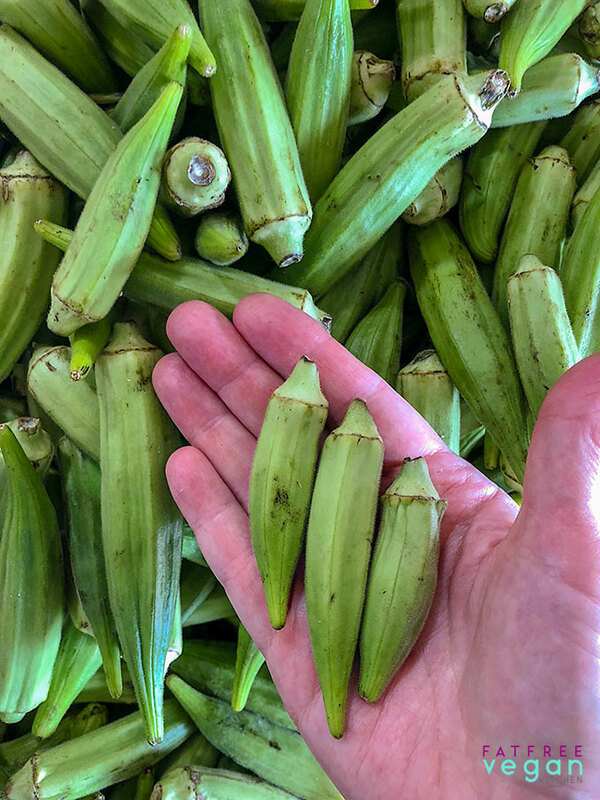 Larger okra is tougher, and while that toughness might cook out in a gumbo or soup, it doesn’t when the okra is roasted. I spend a lot of time at the local farm stand selecting the smallest pods of okra I can find. Update 8/6/18: Since I posted this recipe in 2006, a lot has changed in my kitchen, and maybe yours. Since then, I’ve invested in not one but two air fryers, a small Phillips Viva and a Breville Smart Oven Air. Recently, I made this recipe again using the air frying setting on the Breville Air. Instead of a baking dish, I put the okra directly in the Breville’s wire basket. I set the temperature to 425F, and air fried the okra for 14 minutes. The main difference between baking and air frying in the Breville is that I did not have to stir the okra at all. The pods were evenly cooked in 14 minutes. I also did not have to oil the air fryer basket, which is stainless steel and fairly non-stick. I highly recommend the air fryer for roasting okra. If you have a model other than the Breville, I suggest cooking them at 390-400F for 10-14 minutes or until they are beginning to brown. 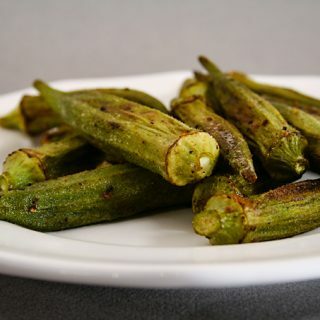 Roasted okra is the simplest way to prepare okra. Okra loses its characteristic sliminess when roasted or air fried and develops a sultry flavor. First, start with the smallest okra you can find. Larger okra tends to be woody, which wouldn't work in this recipe. Wash the okra. Trim off any excess stems, but do not cut into the okra pod itself. Preheat the oven to 450 F. Spray a shallow baking dish with olive oil, if necessary, add okra, and season to taste. Give the okra one quick (1/2 second) spray with olive oil and put them into the oven. Bake, stirring every 5 minutes, until okra is browned on all sides, about 15 minutes. Serve hot out of the oven. Preheat a standard air fryer to 390F or a Breville Air to 425F. 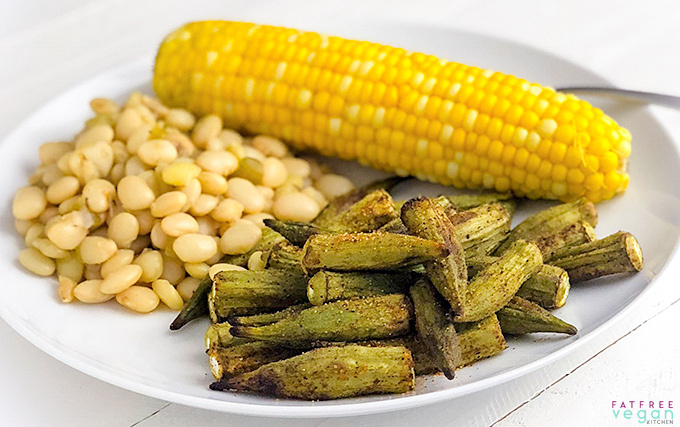 Toss the freshly washed okra with seasoning and spread it in a single layer in the air fryer basket. Begin air frying, checking after about 7 minutes. Air fry until the okra is browning on all sides. You can also jazz these up with spice blends such as garam masala, curry powder, chili powder, Creole seasonings, or jerk seasonings--whatever your taste demands. But simple salt and pepper is amazingly good and allows the fresh flavor of the okra to shine through. Air fried okra naturally has zero Smart Points under Weight Watchers Freestyle Program. If you like Indian food, be sure to check out Roasted Okra Masala. And if you’re a fan of fried okra, try my battered, oven-fried version. I’m not a huge fan of okra cut. It’s too slimy. I finally saw some fresh okra at the grocery store today so I bought some and I did exactly what you said, except I roasted it for 5 more minutes and sprinkled some old bay seasoning on them. They were delicious! Thank you. As long as I can find okra I’ll be eating this more often. Susan, do you think the okra would get crispy w/o the oil? Thanks! I think it’s much trickier to get it browned but not dried out without a quick spray of oil, but I wouldn’t say it’s impossible. You probably just need to watch very closely. I just tried this last night – delicious!!!!!! 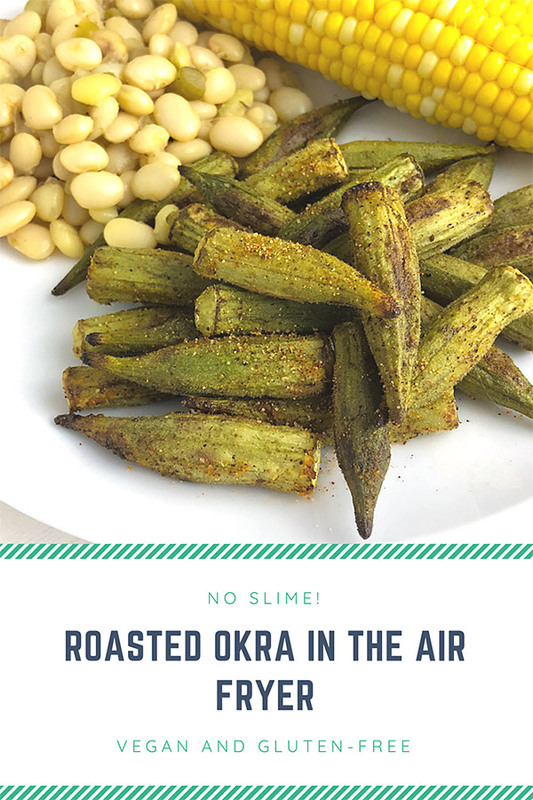 I like okra but rarely buy or cook it at home for no particular reason but something in this recipe (which I found referenced in the roasted okra masala recipe) compelled me to go to the store and buy a pound – and I ate the entire amount for dinner. It was so good I couldn’t stop. Thanks for this recipe! Bought a small package of okra yesterday. I roasted them for the first time. Simply delicious. I am going to find some more tomorrow. I roasted them for quite a while until they were crispy. Everyone try this. Crunchy and delicious. Are they as crispy as the dehydrated okra sold in the bulk section of grocery stores? I love dehydrated okra, but have been too lazy to pull my dehydrator out of storage. This recipe sounds much easier and quicker too. 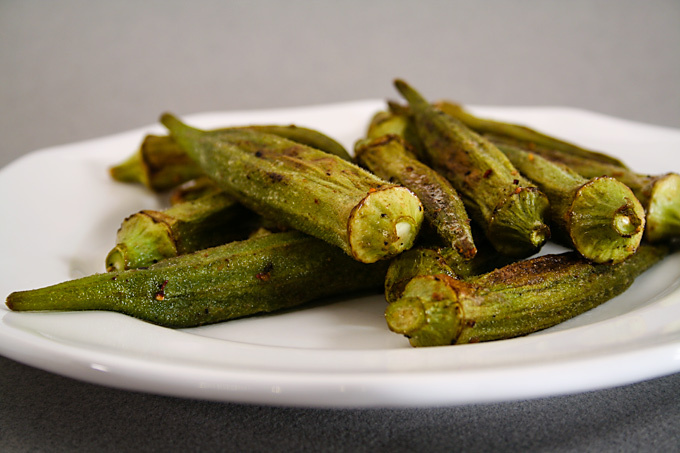 No, they’re slightly crispy on the outside but moist inside–not like a dehydrated okra at all. I tried okra tonight for the ffirst time in 45 years…..I’d had it only once and hated it….slimy! But your recipe was great! And I loved the picture of them. One question: besides the corn on the cob, what else was on the plate (beans of some sort I imagine)? I’m glad you liked it! The beans are fresh baby lima beans, also called butter beans here. I cooked them with some chopped onion, celery, and bell pepper—one of my favorite summer meals. How long do u cook frozen okra in the air fryer?